Bully for You!, Issue #005 -- Educating Others--Could You and Your Dog be Breed Ambassadors? From Me to You: Survey Sez. . .
A big THANK YOU goes out to those of you who have participated in The Proper Pit Bull Survey. Since putting the survey on the site, I've received over 150 responses. I'm really amazed and humbled that so many of you are willing to take the time to do this and share some of the challenges that you are personally facing. I want you to know that I read every single response that comes in. And, I'm learning a lot in the process. For example, the number one frustration that is being voiced is having to deal with the negative stereotyping that goes on constantly in the media and among the mostly uninformed public--and how to reverse that trend. Ok, I might have guessed that one. But, your responses really reinforced how far we have yet to go. Other things that were mentioned frequently were behavior problems (leash-pulling, dog aggression, jumping on people, etc. ); BSL and housing issues (being unable to find a place to rent or being evicted for having a pit bull or being unable to obtain homeowners insurance). As to what you'd like to see in this ezine and on the site, positive stories came out on top closely followed by training tips, health & nutrition and fun games and activities. If you haven't taken the survey yet, there's still time to make your voice heard. Meanwhile, I'm rolling up my sleeves in an endeavor to give you more of what you've said you want and need. This month's feature article on Educating Others is a beginning step in that direction. Again, thanks for your feedback. You are AWESOME! Remember D-boy? D-boy was shot three times while defending his family from an intruder. Well, there's more. Out of 15 finalists, D-boy was selected to receive the Dogs Of Valor Award given each year by the Humane Society of the United States for exceptional heroism by a dog. The contest is decided by popular vote. Here's the CNN news story. Could this be the next Dogs of Valor recipient? Thor alerted his family that their home was on fire in the dead of night. Not only did he manage to wake up the sleeping couple, he pulled the bassinet containing their 3 month old baby to the front door! Thanks to Thor, everyone got out alive. Watch the video or read this amazing story. Topeka Kansas may be getting ready to scrap the BSL they've had in place for 10 years--acknowledging it's put them over budget and it hasn't made anyone any safer. If you'd like to let the powers that be know how you feel about this, here's an article with contact info for city officials. Experience has shown that even if you don't live in the affected area, your emails and letters of support can make a difference. Your Questions Answered About. . . Pit Bull Getting Dog Aggressive? Reader's Share Their Thoughts. . .
Who are the Dangerous Dogs? . . .And the pictures and stories keep on coming! Go to our Pit Bull Pictures page and create a web page for YOUR dog--easy as 1-2-3! 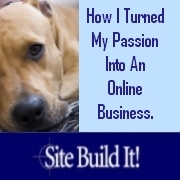 I know some of you have websites for your rescue group, club or business. And, I wanted to share that this past month I've experimented with Facebook Ads and I have been really impressed with the results. Not only have the ads delivered targeted traffic, it's affordable! I paid an average of .03 per click and last month I netted 600 new ezine subscribers and over 1000 "fans" to the site's FB page. So, even if you only have a little money to spend on advertising and you want more traffic to your blog or site, you may just want to check them out. Nothing seems to frustrate, annoy, sadden and anger us pit bull owners quite so much as the negative stereotyping of our beloved pets. Whether it's the media capitalizing on the "monster myth" or an ignorant comment from a stranger on the street, we live with the awareness that our dogs are feared and disliked by a sizable segment of the public. We know too, that people who barely know us will make assumptions about us for owning such a dog. We feel the unfairness of it all. We want to tell those people they are wrong about us and wrong about our dogs. After eleven years of owning pit bull terriers, I know better than to argue with anyone about how wrong they are. Still, once in awhile I allow myself to get sucked into a debate on the issue. And, predictably, it never ends in a way that could be described as satisfying. Every so often, someone will tell me that they used to be afraid of pit bulls--couldn't fathom why anyone would want to keep one as a pet. And then one day, something changed their mind. Looking back on those conversations, the something was never someone telling them how wonderful pit bulls are. Not once. And, it wasn't someone insisting to them that they had been brainwashed by the media either. No, it was always an encounter with a well mannered pit bull that made the difference. I've come to the conclusion that we really don't change anyone's mind. People change their own minds. And when they do, it's usually the result of a change of heart. And when it comes to changing hearts, our dogs are usually better at it than we are. Several years ago, I worked in the Education Department for the SPCA of Texas. My office was right across the hall from the agency's Public Relations/Media Department with which we often worked hand in hand. While there I learned quite a bit about the art of educating people on issues they think they understand, but don't. Dad: "So how was school today?" Johnny: "It was Ok. Oh, a lady came and talked to us about being kind to animals. She brought her dog. That was the best part!" Dad: "Really, what kind of dog was it?" Johnny: "It was a pit bull named Sampson." Dad: "A pit bull? Were you scared?" Johnny: "Nah. He's a really nice dog. I got to pet him and give him a treat too." Even if Dad decides to call Johnny's teacher out of concern, the message will just be reinforced. Sampson is a nice dog. The kids had a great time and learned something in the process. This is how openings are sometimes created. Dad might just be ready to take in some new information about pit bulls. Or he may at least be less likely to believe the stereotypes about them without question. Lesson #2 - Hearts change first--then minds. When someone holds a negative opinion or is indifferent to something, facts and statistics are virtually useless. The indifferent will be bored. And, those with an opposing opinion will be tempted to defend their position if for no other reason than to "be right". The wiser path is help your audience connect emotionally with your message first. This message is aimed at the average person (not a dogfighter) who may not think that dogfighting is something they need to care about. Instead of throwing statistics at the viewer or a litany of the social ills caused by dogfighting, the message appeals to the viewer's sense of decency. It's memorable. But at the same time, it doesn't go too far by assaulting the viewer with horrific images. And, as I so often experienced in my work, when it's all said and done, it's the dogs that grab our attention--and our hearts. Lesson #3 - Facts and statistics do have their place. Once someone has connected emotionally with a message, then they are often ready--even eager--to have more factual information. It's at this point that educational material can be really helpful because it reinforces what the person is beginning to feel in their gut. Whether you work in an official capacity to combat negative stereotypes about pit bulls or whether you do so casually and informally, it's good to know how to pick your battles. Realize that some people won't be ready to hear what you have to say until they've had a change of heart. And, when it comes to changing hearts, your best ally could be your four-legged best friend. Are You Enjoying Bully for You!? Would you be willing to let others know? If so, please send me a testimonial for use on the website stating your name, location (or website) and why you like this zine. I appreciate your support!